Menus built for mobile users. No more PDFs! Beautiful sites that look great on any device! Setup & Management of Facebook, Google+, Twitter, & More! Foursquare, & other Restaurant listings. At Vektor Media, we will deliver a professional restaurant website design and marketing package that will effectively target new customers and keep current ones coming back. As a professional restaurant website design company, our designs not only look great, but give your customers easy access to your menu, location, and contact information. We will analyze your competition, find your target audience and create a marketing plan that will get you results. More looks at your menu, more calls, more requests for directions, and more people eating! 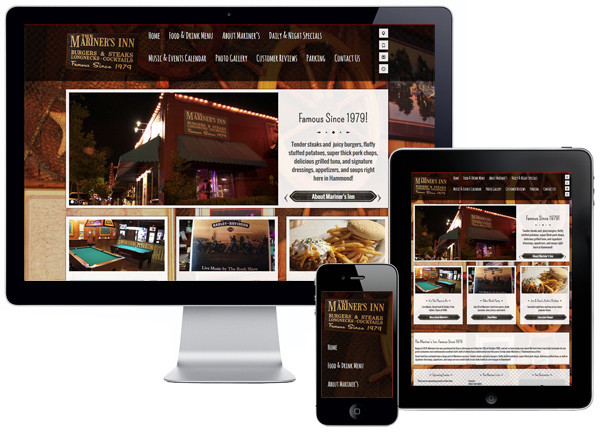 Your website will give customers a quick sense of your restaurants style, surroundings, location, ambience, and food. You know how great your food and restaurant is, now let us tell the world. Your customers are using tablets, smartphones, smart TVs, netbooks and many other devices to get your information from virtually anywhere. It is absolutely essential that your restaurants website provides a good experience on all of these devices. Vektor Media designs specialized websites, so your customers always get the information they need, no matter what device they use. This information includes, choosing a meal from your online menu, calling your establishment, placing an order, making a reservation, getting directions and more. Your customers are hungry (for information AND food) and they’re using their phones to search your website for a cure to their cravings. What will you serve them? Get Your Restaurant Website Today! Contact New Orleans restaurant website design company Vektor Media at 504-458-7708 or click the arrow to fill out our contact form.